Bellingham, WA – Bellingham Marine, leading dock designer and marina builder, is pleased to announce the appointment of Rob Rasmussen as General Manager of Bellingham Marine’s Northwest Division, located in Washington State. Mr. Rasmussen will oversee the day to day operations of the Division including manufacturing and general contracting activities. Prior to joining Bellingham Marine, Rob worked for one of the U.S.’s top construction companies, Granite Construction for eight years, after spending ten years with a highly regarded local contractor, Strider Construction. 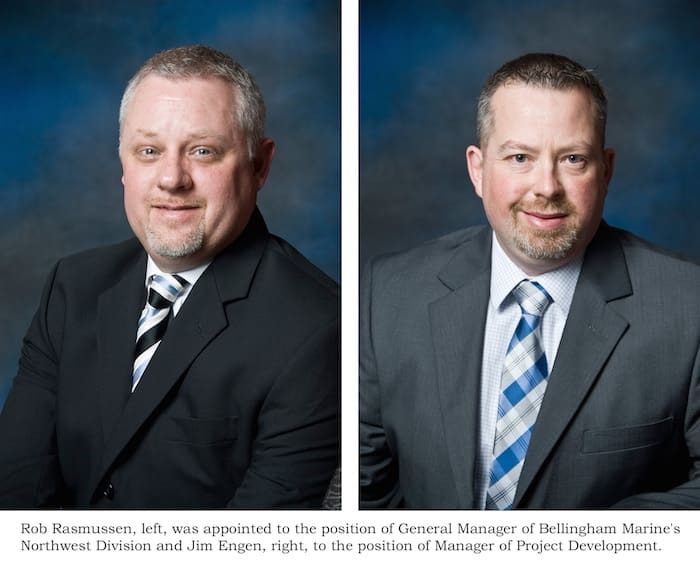 Following the appointment of Mr. Rasmussen, Jim Engen, 20-year employee of Bellingham Marine was promoted to the position of Manager of Project Development. Mr. Engen has held numerous leadership positions within the company including, most recently, Operations Manager and Senior Estimator. In his new role, Mr. Engen will be responsible for sales of marina and other precast products, marina assessment, contract development, engineering management and project coordination. As the world’s leading marina design-build construction company, Bellingham Marine specializes in floating dock, floating platform and floating wave attenuation systems for marinas worldwide. The company also produces other specialized precast concrete products and dry storage systems for the upland storage of boats.